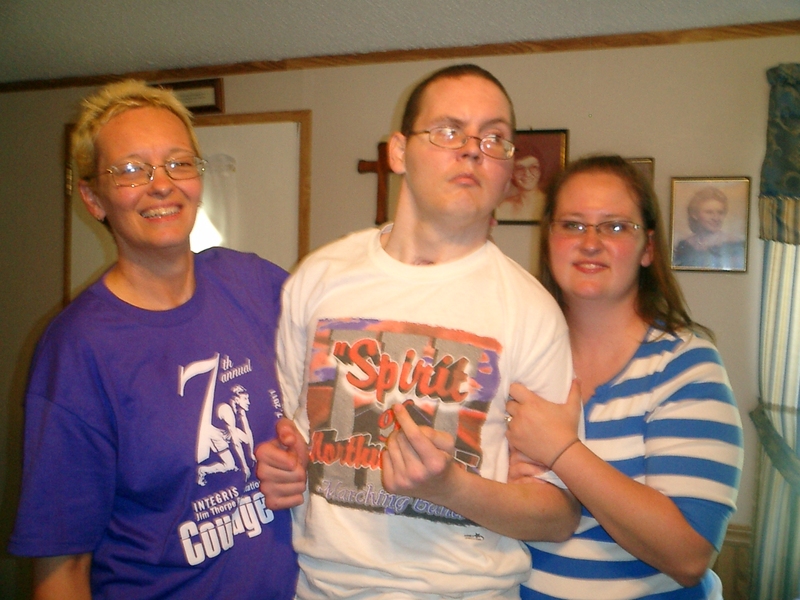 It was one year ago on July 1 when I brought Chris home. I was a bundle of nerves! I cannot even begin to describe how scared and excited I was that day. It was so good to see him in a home setting again where I knew it would not be so loud and all that. I had no idea how, or if, he would respond to being in a home again. I was so scared to transfer him and of course back then he was so stiff and had quite a lot of tone. He was also on all sorts of meds! I was either feeding or giving him meds every two hours. That went on for a couple of days til I figured out I could combine the feedings with the meds! duh! There were so many things I struggled with and some of the frustration was just trying to go too fast for his head injury! I finally learned how to balance it all out – take advantage of good days, and rest on his worse days…I also got him off all his meds and all he takes are vitamins, tylenol, ibuprofen and claritin! How cool is that! I never dreamed when I shakily made that first transfer with him that he’d be doing so much more of it now. He is also awake almost all day long now too. It takes him quite awhile to settle down at night but he eventually gets to sleep around 11. I have learned much about my Father’s patience too…and how He desires for all of us to be whole in Him…Andreally over this last three years I have watched God provide.. I have never lacked anything…I may have wanted a thing or two.. but never lacked… I have gone in at night and thought I only have the gas to make it back to town tomorrow. I just packed a bag and figured I’d sleep in Chris’ truck…but gas money always came…I have not had to miss even one meal this whole time…I actually need to miss a few and lost about 10 or 15 pounds now!!! I’ve watched God restore things I hadn’t even recognized were gone…and I have learned true thanksgiving. I cannot be anything other than thankful from here! I cannot wait until I see what He has in store for Chris’ second year on the home front!! Simply Excited…and I don’t Even Know Why! I am loving the new apartment! It is just perfect for us. I like having my own room – and Chris having his. It seems I can hear him fine from any place in the house. That’s somewhat because he is so much more vocal. I wonder what the neighbors think when he is making such a terrible moaning noise in the middle of the night! His chair actually fits perfectly except I’m a little disappointed that I cannot get him outside on the patio. I’ll just need a little ramp of some sort…eventually I guess. It seems so huge after that timy little place we’ve been in! I’m sure we’ll have it stuffed to the max soon too! It just feels good and right for now. I cannot really even try to explain that sort of excitement. But the present and the future look good. It’s pretty positive from here I think. That is some because Chris has been what I would call “awake” for more than a month now..every day – even though he has had his sleepier times, he is not in what I’ve called the brain injury fog. That’s where I have to find faith to make it another day. I also have to just look at the day I am given today and work with what is in my hands today. Sure, the plan is to help Chris unltimately – even in my limited knowledge of brain injuries and therapy – but not knowing what tomorrow will bring makes it difficult to set realistic goals.So I have to go back to a scripture in Psalms – it says my times are in His hands Why He has us here living through this I cannot answer – but I know that He is not only with us – we are in HIs hands and He holds the tomorrows and the todays in His hands. He is holding us…I have to believe that to keep taking steps…any steps!